At Riverheart Family Dentistry, we realize that dental problems are not always predictable. In fact, a toothache, tooth injury or other dental emergency, can occur at the most inopportune times. We do not want your dental concerns to disrupt your day or compromise your smile longer than they have to. As part of our general dental care services, Dr. Schwarz proudly provides emergency dental care to patients of all ages in O'Fallon. 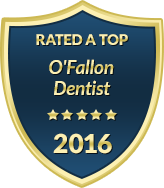 Because we believe that everyone deserves a beautiful, functional and comfortable smile, we always take your urgent dental matters seriously. With his expertise in restorative and cosmetic dentistry, you can trust Dr. Schwarz to restore your teeth and gums to optimal health with focused attention on restoring the aesthetics of your smile as well. If you are experiencing sudden tooth pain or trauma to your teeth or gums, please let us know as soon as possible. Our office makes every effort to see you promptly so that further complications can be avoided. During your emergency dental treatment, Dr. Schwarz will first and foremost bring you out of pain. Riverheart Family Dentistry is equipped to treat a wide variety of dental emergencies with services such as crowns, bridges, tooth extractions and root canal therapy as well as a full menu of cosmetic dental services to ensure you regain the most attractive, confident smile possible while maintaining optimal oral health. When it comes to your emergency dental procedures, our practice offers sedation dentistry and the latest in dental technology to keep you comfortable and relaxed. Dr. Schwarz is diligent to explain your treatment options to you so that you can make informed decisions about your dental health, especially when it comes to restoring your smile after a dental emergency. If tooth pain is disrupting your day, contact Riverheart Family Dentistry right away for trusted care. We are happy to accommodate your emergency dental problems with same day service if needed. Our office also offers early morning and late evening appointments for your added convenience.